Posterior wall of inguinal canal being sutured and imbricated. Hernias unlike skin cancer, other malignancies and many infections, are a common universal problem. The incidence is not affected by geographic distribution, race, genetics, skin pigmentation, dietary habits, climate or environment. The optimal treatment for most hernias is operative. The symptoms from which the patient suffers and the risk of obstruction or strangulation influence the decision to operate, as well as the timing of such surgery . The age and health of the patient, the risk involved and the availability of resources may affect the decisions. The severity of symptoms or the possibility of strangulation must be balanced against the risk of the anaesthetic, the operative or post-operative complications and the long term success of surgical repair. This module of 7 programs contains 5 on the diagnosis and treatment of inguinal, femoral, epigastric, umbilical and incisional hernias. There are 2 programs of scrotal conditions and malignant testicular tumours. These are considered with hernias because of the close anatomical and functional relationship with the inguinal canal. It is mandatory to examine the scrotum where any groin hernia is present and conversely, to examine the groin in the presence of any scrotal problem. Like hernias, the diagnosis of scrotal conditions and testicular tumours is based upon clinical methods without the need to resort to complex investigative procedures. These programs are not meant to be a definitive text on the subject, but rather a guide to the diagnosis and surgery of common hernias and inguino-scrotal conditions. The programs can be used in the dissecting room, the tutorial or lecture theatre to demonstrate the anatomical, clinical and operative features simultaneously. The programs can be used as part of a distance education program, for self assessment or peer review programs. The pre-clinical student studies the anatomy of the abdominal wall, inguinal canal, femoral canal and scrotum in great detail. The Clinical student is taught to apply this, together with the history and demonstration of physical signs to arrive at a precise diagnosis. The residency staff are required to understand the pre-operative and post-operative care. The primary care physician should do all this and be able to counsel a patient - patients wish to know the different possibilities. The primary care physician is also usually responsible for the initial assessment of the degree of urgency, referral for surgical assessment and the decision regarding where and by whom the surgery should be performed. The surgeon in training is required to develop the clinical skills and operative techniques to deal with hernias. The nursing staff work side by side and they should be knowledgeable in these different aspects, so they can best administer the care pre-operatively, be part of the surgical team and then give post-operative care. These programs have been designed to be of benefit to all of these groups. Hernias have been a surgical problem since time and more. Many of the great names of surgeons from bygone eras including Bassini, Halstead, Tanner, are attached to advances made in the anatomical understanding and surgical repair. In those bygone years inguinal and femoral hernia surgery was carried out through what was termed the open anterior approach. That is for an inguinal hernia an incision was made over the inguinal canal  the hernia dealt with and then the repair of the posterior wall carried out. There were numerous techniques and modifications to this repair  the commonest being the Bassini and Italian surgeon. Another method described and popularized by Stoppa (and Nyhus) was to approach the hernia from behind by making an incision higher in the abdominal wall and then dissecting behind the muscle into the pre-peritoneal space between the peritoneum and the posterior wall of the inguinal canal. Sutures and mesh were placed behind the posterior wall. One of the foremost modern components of the open anterior approach was the Shouldice Clinic Toronto, Canada  they used 4 layers of non absorbable suture to repair the posterior wall and reported amazing results for that time. The procedure was carried out under local anaesthesia and their clinic attracted patients from all over Canada and the United States. This was a unique centre where thousands upon thousands of cases were treated in a hospital devoted solely to hernia surgery. Then along came mesh and Dr Lichtenstein of Los Angeles. He also used local anaesthesia and advocated the use of polypropylene mesh and made the TENSION FREE repair almost a household name. He rejected the Bassini concept of suturing the posterior wall down to the inguinal ligament, because of the tension involved.This tension when the patient strains of coughs causes the sutures to cut out. The Bassini repair reported as having very high recurrence rate whilst Lichtenstein results matched those of the Shouldice Clinic. 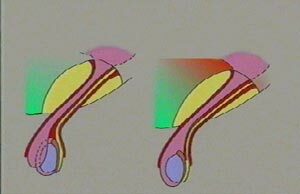 Lichtenstein technique was to imbricate the posterior wall and narrow the internal ring, but not suture down to the inguinal ligament. The strength of the repair is obtained by the use of a permanent mesh. Other surgeons were using what was termed the darn technique. Here multiple layers of suturing are use to almost replicate a mesh. In addition many of these techniques used an extensive relieving incision in the anterior sheath of the rectus muscle to reduce the tension required to pull the muscle together in the repaired. The ability of the patient to cough and strain during the procedure under local anaesthesia seemed to give a new understanding to the philosphy of the posterior wall of the inguinal canal and the way it should be repaired. 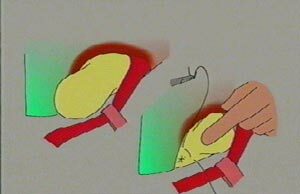 (1) The Bassini repair conservative suturing style of the posterior wall of inguinal canal. (2) The Shouldice suturing technique of the posterior wall of inguinal canal. (3) The Darning technique of posterior wall of inguinal canal. (4) The Lichtenstein Mesh and Plug tension free repair technique. Using minimal suturing. (5) The posterior approach of Nyhus or Stoppa. Just as everyone was getting comfortable with these icons a revolution occurred in the late eighties LAPAROSCOPIC HERNIA REPAIR. This was a posterior approach similar in some ways to that of those of Nyhus. It was carried out laparoscopically though either an extra- peritoneal approach (TEPP) or a trans abdominal approach (TAPP) . (a) The difficulty in learning the technique. (b) The more than occasional serious complication. (c) The need for a general anesthetic. (e) It has not been proven to cause less post operative pain than the local anaesthetic technique or indeed that return to work is quicker. (f) Discussion as to whether the recurrence rate has improved. An extensive series in the recent (2004) New England Journal of Medicine showed a higher recurrence rate in some  8% in 2 years as opposed to 4% in 2 years for the open techniques. Both these rates are in excess of the previous report with good results, (Shouldice and Lichtenstein). The objectives of the open tension free technique and the laparoscopic technique were to reduce the recurrence rate, promote early return to normal activities and work, because of the absence of tension on the repair. The mesh gives immediate strength. The absence of tension is said to reduce the severity of post-operative pain allowing earlier mobilitity and activity. A stalemate was reached as over the last couple of years in most centers laparoscopic hernia repair has decreased for example from 12% of repairs to 6% of repairs. It seems that most surgeons are doing the open repair and the laparoscopic repair is being concentrated in the hands of fewer surgeons who have more extensive experience. In a similar manner Lichtenstein technique became more popular because it seems to be agreed by most that it is much easier to learn and replicate than the Shouldice technique. 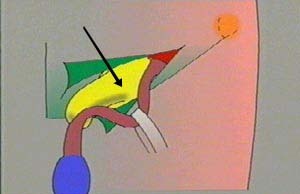 However laparoscopic repair stimulated a new approach combining anterior local anesthetic approach but placing the mesh behind the muscles, like Stoppa, Nyhus and laparoscopic techniques as through a inguinal incision. A variety of materials, indifferent shape has been promoted by different highly reputable surgical material companies. These include kugel patch or the prolene hernia system. These mostly rely on the developing plain between the peritoneal and the muscles with finger or blunt dissection. This is done through the deep inguinal ring in the case of indirect hernias, and by dividing the transverse fascia with direct inguinal hernias. The sac need not be excised after the mesh is placed and fixed into position. With minimal suturing a layer of mesh is then placed superficially to the muscles. This mesh may only require one suture to sustain it into position. Another popular modification to this last technique is the use of self-expanding mesh. The muscles are split above the lateral to the deep ring and this expanding sheet of mesh based deep to the muscles after the hernia has been reduced (kugel patch). The Bassini repair, which excised the indirect sac and pulled the posterior muscles down to the inguinal ligament, has lost popularity. This still has its component, especially those who abdicate the use of relieving incision with this. My experience in Fiji showed that many countries cannot afford mesh or do not have the mesh available for use. While most would consider mesh to be a significant cost benefit  lower recurrence rate - this will not necessarily alter the situation. Over the last 30-40 years we have seen the hospital stay of hernia repair plummet from 5-14 days, where now most of the patients can be discharged home the same day. It is difficult to attribute this to any single factor. As all these improvements have occurred more emphasis being placed on the incidence of chronic pain following hernia surgery. This is said to occur in up to 5% of hernia patients in some series. Some attribute this to the increasing use of mesh and new words have have crept into the English language  meshoma. A variety of meshes are being designed to be of lighter weight, less reactive and to reduce symptoms of adhesions where used for incisional hernia repair. Laparoscopic hernia repair appears to have gained a significant place in the repair of incisional hernias. Maybe the laparoscopic hernia repair or incisional hernias will increase. The use of laparascopic hernia repair for recurrent inguinal or femoral hernias seems to have a reasonable place which is still being evaluated. "External hernia of the abdominal wall"
This introductory program deals with an approach to the clinical diagnosis based on the history and physical findings. The functional anatomy and the complications which may develop, the type of defect, the mechanism of the hernia protrusion are demonstrated for most of the common types of hernia. The subsequent programs deal with each type in greater detail, still relating the anatomy and clinical examination to the operative findings and surgical techniques. Click here for further information. "Indirect and direct inguinal hernias"
This focuses on the different modes of development, anatomy, clinical findings and causes of the two different types of hernias. The principles of surgical repair are demonstrated as exemplified by the narrow neck of the indirect hernia and the wide bulge of the direct hernia. "Hernia repair under local anaesthetic"
This demonstrates in detail, local anaesthetic infiltration techniques used for hernia repair. The local anaesthetics, lignocaine and bupivicaine are used in combination with Adrenalin. The factors which enable the technique to be used successfully are discussed. The management of the patient before, during and after the procedure, principally relating to inguinal hernias but applicable to other types of hernia, such as femoral, epigastric and umbilical is demonstrated. - deals with the fundamentals of the anatomy of the femoral canal and of femoral hernias. Their diagnosis, differential diagnosis, surgical approach and operative findings are demonstrated. The merits of each approach are compared. Includes epigastric, para-umbilical, umbilical and incisional hernias. The mechanism and development of these types of hernias and the defects through which they protrude are demonstrated. An approach to management of each type is presented. A. Rollover image for explanation of diagram. B. Rollover image for explanation of diagram. These diagram shows the general structure of the abdominal wall. It shows the 3 main muscles in brown. These muscles fuse and form a large aponeurotic tendon sheet (termed the rectus sheath) and this encloses a single strap-like muscle - the rectus abdominis muscle - the rectus sheath fuses in the mid-line to form the linea alba (white). Because this is a single layer here this is a potential weakness and thus a common site where hernias develop - termed 'epigastric' hernias. - concentrates on clinical diagnosis using the history, anatomical localisation and physical characteristics of the swelling. The age of the patient, the presence of pain and the mode of onset often help in diagnosis. The swelling is anatomically localised to the scrotum using the pinch test. It is imperative that the acute pain described with the onset of torsion of the testis should not be confused with epididymo-orchitis. Signs such as tenderness, consistency, transillumination and fluctuation are important. The possibility of a malignant testicular tumour must not be overlooked. Some basic treatments such as aspiration and excision of epididymal cysts and hydroceles are demonstrated. The pathology, clinical diagnosis and surgical management with emphasis on the groin incision is demonstrated. Orchidectomy is the first step in the treatment. Further treatment is based on the type of malignancy and the staging of the disease. Adjuvant therapy for seminoma using radiotherapy and chemotherapy for non-seminomas is discussed. The emphasis is placed on early diagnosis, which together with modern therapy is giving high cure rates.